At the beginning of the video, there are several seconds where QLab has become completely unresponsive around this cue. When played, the application of the effect is delayed, and in this case, preloading has no effect. When the audio cue is halted with a stop cue, the sound cuts immediately and no tail is played. This is less common than the overlong tail reporting, but the stop dead behavior is found in a lot of plug-ins. The simplest solution, for getting a good tail at the end of a sample, is just to extend the length of the audio with some silence at the end. 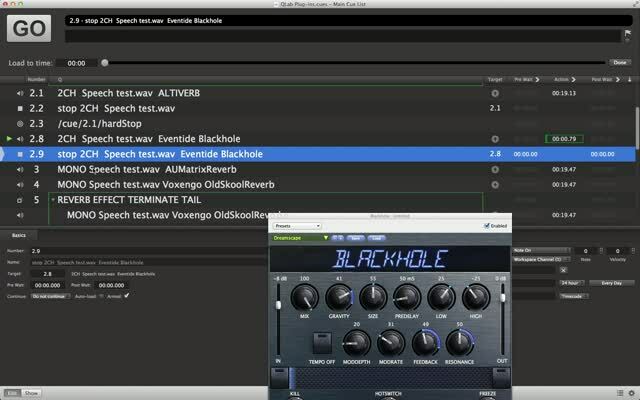 In QLab 4.1, Blackhole, and other complex reverbs, behave much better. There is still an issue at the beginning of audio cues, where the effect doesn’t appear to be applied for around a second.